O'Neill and Teal'c are caught in a time loop in the S.G.C., and must relive the same 10 hours over and over again. SG-1 arrives on P4X-639, an abandoned, desolate world with a blazing hot sun overhead and ancient ruins surrounding the Stargate. They meet Malikai, an alien archaeologist who has been studying the world for many months, first encountered when SG-15 was here two weeks previous. As Samantha Carter sets up equipment to monitor the sun’s unique coronal mass emissions, Daniel Jackson examines the alien text carved into the stone walls. Before Jackson knows what’s hit him, Malikai pulls a weapon and shoots him. He activates an alien machine — a stone altar just a few yards in front of the Stargate — which causes abeam to shoot out and hit the Stargate. Jack and Teal’c try to stop him, while Carter rushes to Daniel’s side. There is a blinding flash of light, and all is gone. Jack O’Neill finds himself sitting in the S.G.C. commissary, eating a bowl of Fruit Loops. It doesn’t take Jack long to figure out that he’s been thrown back in time, roughly 10 hours. He and Teal’c are both experiencing the same day over again. They are checked out by Dr. Janet Fraiser and given a clean bill of health. After they predict the unscheduled arrival of SG-12, General Hammond and the others are convinced they are not delusional. The afternoon mission to P4X-639 is cancelled. But the move does little good. When a wormhole is established with Earth’s Stargate, SG-1 witnesses the energy beam hit the gate. Seconds later, Jack is back in the commissary with Carter and Jackson, eating his cereal. Again, Jack and Teal’c must convince Hammond, Jackson and Carter that they are all stuck in a time loop — though only Jack and Teal’c are aware of it. This time around, though, O’Neill convinces the general that simply scrubbing the mission will not break the loop. They’ve already tried that. SG-1 goes to the planet and again meets Malikai, who claims to have never met them before. But it isn’t long before he gives himself away; Malikai is caught in the same loop, but remembers previous loops. Indeed, this was his goal. With an infinite amount of time at his disposal, he intends to figure out how to properly work the alien time device in order to revisit his past. SG-1 fails to stop him, and the loop starts all over. Carter comes up with a new plan: if Earth’s Stargate is already connected to another planet when the alien time device is activated, it won’t be able to get through. The loop will be broken, or at least Earth will be left out of it. The gate is dialed, but the plan does not work. For an unexplainable reason, the seventh chevron fails to engage — no wormhole can be established. The beam hits the Earth gate again, and everything starts over — again. In the next loop, Teal’c and Jack approach Daniel. They believe that if he can translate the inscriptions on the altar device, Daniel can turn off the machine. Since there is noway for Daniel to accomplish such a feat in less than a day, he enlists Jack and Teal’c to help him translate the markings. The alien language, is in fact, a derivative of the language of the Ancients — the advanced race who built the Stargate network. SG-1 has encountered it twice before (“The Torment of Tantalus”, “The Fifth Race”), and Jackson knows that it is linguistically similar to Latin. Loop after loop after loop, Jack and Teal’c study Latin and help Daniel to translate the inscriptions on the altar and the walls surrounding it — making a little progress each time. Jack becomes increasingly frustrated with repeating the same 10 hours over and over again:the same Fruit Loops, the same conversations, the same task of convincing Hammond, Carter and Jackson that they are all stuck in a time loop. He and Teal’c decide to take a break before they go crazy — especially when Daniel points out that they can do anything they want without fear of consequences. Jack tries his hand at pottery. Teal’c — who has entered each new loop getting hit in the face with a door — slams it on the airman who continually hits him. 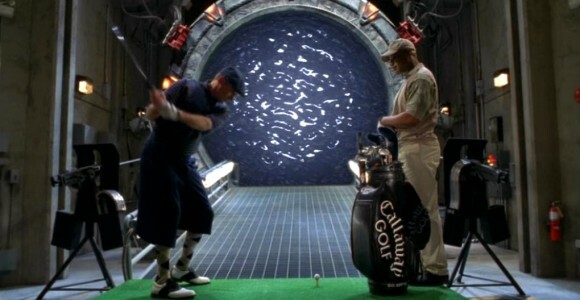 And the both of them hit golf balls through the Stargate, despite General Hammond’s livid protests. Finally, before going back to studying, Jack finishes a loop by handing the general his resignation and kissing Carter passionately. Back in Daniel’s office, their translation work is done. The walls on P4X-639 contain an ancient history of the people who lived there: a colony of the Ancients. Many centuries ago, the colony was struck with some sort of cataclysm (perhaps a disease, perhaps something else). They invented the time device to try and alter their history, but could never get it to work. They spent loop after loop trying to perfect it, but it did not work. Finally, the people gave up, turned off the machine and let the inevitable come. SG-1 returns to the planet to try and reason with Malikai — who in the many loops since has erected a force shield around the altar device. They discover that he is trying to go back many years into the past, before his wife died. He cannot save her (she died of a congenital heart defect), but he does wish to be with her once more. Daniel tells Malikai about their discovery: the people who built the machine couldn’t ever get it to work. They gave up. Carter tells him about her theory: the device is simultaneously accessing 14 Stargates, causing time to loop for billions of people. And Jack, who understands Malikai’s pain all-too-personally (having lost his own son), convinces him that he does not want to watch his wife die again. Malikai lets her go, and deactivates the machine. Back on Earth, the Tok’ra contact the S.G.C. with the news that they’ve been trying to contact them for than three months. The team may never be sure how much longer than that they were caught in the loop. And although it was a nightmare to relive the same 10 hours hundreds of times, O’Neill and Teal’c had one heck of an opportunity to do the things they never could have done before. Jackson tells Malikai that he had the opportunity to hear the Ancients’ language spoken aloud. This was about a year and a half ago, when O’Neill had the knowledge of the Ancients downloaded into his brain (“The Fifth Race”). To create a time loop, the alien time device uses the Stargate’s capability of generating a subspace field. It accessed 14 Stargates around the planet simultaneously, according to Carter’s theory, generating a subspace bubble. The subspace field generation is likely a part of the gate’s standard function of creating a wormhole between to gates. Notice that when Malikai first activates the alien time device, it actives the Stargate (establishing a wormhole) and then immediately deactivates it — but the electrical interference on Earth’s gate continues. It seems odd that the device would continue to affect the Earth Stargate after the wormhole was terminated. It apparently had no need to continuously access the 14 accessed gates through wormholes after the subspace bubble was generated. According to Carter’s theory, everyone on every planet within the subspace bubble around P4X-639 would be caught in the time loop it caused. Those planets with Stargates (Earth and 13 others inside the bubble) were able to access other gates within the bubble, but nothing outside of it. The Stargate would simply be unable to establish a wormhole through the bubble’s edge. Jack studies the book “Latin for the Novice,” by Joseph Mallozzi, Ph.D. Mallozzi is actually a writer on the show, and co-wrote this episode. The alien device is powered by the planet’s geomagnetic storms, which are caused by the sun’s unusual coronal mass emissions (giant solar flares) approximately once every 50 years. Without the presence of these storms, it would seem, the device will not function. Since the time loop lasted for more than three months (and presumably longer when the Ancients were using it to save their colony), it stands to reason that P4X-639 and its powerful storms are also reset by the time loop. Jack and Teal’c lived through somewhere in the neighborhood of 220 time loops — 10 hours at a stretch for over three months. We saw scenes from about 22 of those. Teal’c – Though he had to endure the same 10 hours over and over again hundreds of times, Teal’c has learned a good amount of Latin, and has learned to juggle. What was the cataclysm that wiped out the Ancients’ colony? Was it something that even the Ancients and their advanced allies could not overcome, or was the colony cut off from the rest of their race? From what planet is Malikai? He appears human, and possess advanced technology. What question did Daniel so passionately keeping asking Jack over the breakfast table? What else did Jack and Teal’c do that they never would have done? Did Teal’c and O’Neill require sleep at all? For how long was Earth trapped in the time loop? Have there been any significant developments in the struggle against the Goa’uld during those months? Since time is measured in terms of rotations of the Earth and revolutions around the sun, will there be any cosmological side-effects of the subspace bubble? Was the rest of Earth’s solar system affected as well? Won’t star charts be thrown completely off? “We had no idea this episode would become so beloved by fandom and yet, looking back, it’s easy to see why. It’s one of those fun episodes with a fairly straightforward premise that allows our characters to shine in ways unexpected. Specifically, Jack and Teal’c who, in past episodes, have relied on Carter and Daniel to handle the science and Ancient, and suddenly find themselves having to step into their team members’ shoes. Yes, it’s our version of Groundhog Day but it works because the time-loop conceit is secondary to the heart of this story: the characters. “And yet, in its earliest form, the pitch for this story was very different, much darker in tone. It involved the team gating to a planet and becoming trapped in a seemingly endless time loop orchestrated by a dying race seeking to buy more time to come up with a solution to an impending Armageddon (which became the backstory of the device’s genesis mentioned in the episode by Malikai). Rob suggested another spin on the time loop angle and, while I was dubious at first (‘Isn’t this Groundhog Day?’ I remember asking. ‘Yeah,’ was Rob’s counter), I was proven wrong (that happened a lot with regard to some of Rob’s ideas those first couple of years). VOTE! How would you rate SG-1's "Window of Opportunity?"